This trail site boasts a species list of over 200 and is considered one of the best all-around birding spots in southwest Florida. The tidal lagoon at the “beach” offers great views of shorebirds including Wilson’s, Piping and Snowy Plovers, as well as Least Terns, Roseate Spoonbills, Red Knots, Reddish Egrets, and Magnificent Frigatebirds. Peregrine Falcons can be found during migration and in the winter, while Osprey, Bald Eagles and pelicans dive offshore. An ADA-accessible Wildlife Viewing Tower was recently installed with bird ID guides and scopes, another great feature to explore. This corner of Marco Island is a true “hotspot” during spring and fall migration; 20+ species of wood-warbler have been found including Cape May. 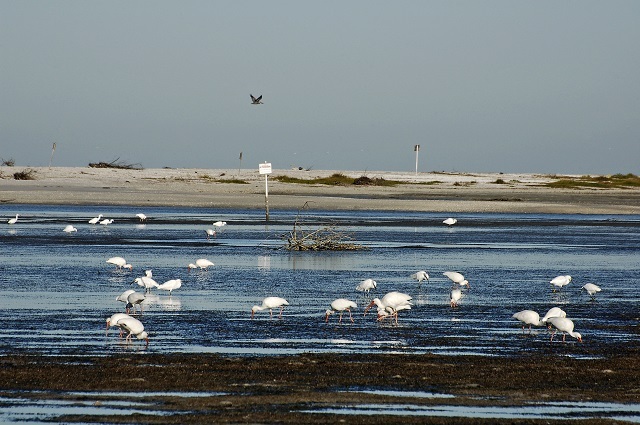 When visiting this site, be aware that the lagoon and sandbar areas are designated as Big Marco Pass Critical Wildlife Area, established to protect the nesting and foraging birds. Please respect all beach closings and practice good birding etiquette. Click here to learn more about Big Marco Pass Critical Wildlife Area.